The best-known (at least in modern times) mascot of Christmas, developed in the United States as an amalgam of the story of St. Nicholas of Myra and various other seasonal folk heroes, with many aspects provided by the classic poem A Visit From St. Nicholas (popularly known by its first line, ''Twas the Night Before Christmas). The Santa Claus myth is based largely on the Dutch holiday of Sinterklaas (a hastily pronounced "St. Nicholas", who comes down the chimney on the 5th/6th of December) and the imagery of the Saint in question carried over to his North Pole incarnation. In the original stories, Sinterklaas was accompanied by black slaves; these have become demons (The Krampus) in German-speaking culture, and friendly elves in the USA. In the Netherlands, the black companions are nowadays portrayed as St. Nicholas' friends and employees. Note that in several countries in Europe, Sinterklaas and Santa Claus are now considered two entirely different characters, each with their own elaborate holiday. The habit of distributing gifts attributed to all these characters is ultimately derived from a legend about St. Nicholas, according to which he secretly threw gold into the house of a poor man by night, so the man would not sell his daughters into prostitution. Santa Claus is universally envisioned as a festively overweight, old man with a long white or silver beard, who wears a red suit with white trim and a matching cap (originally a red bishop's robe and camauro ), black boots and a vast black belt worn across his belly. He lives at the North Pole (or in Lapland, or in Spain, or somewhere else depending on your culture — the original St. Nick was Greek, from a city in what is now Turkey) and oversees a large workshop staffed by elves (diminutive commercial-friendly elves, not tall proud Tolkien-type elves — D&D players will see more of a resemblance to gnomes) who are often far older than they look. These elves in their workshop produce toys year-round, and every Christmas Eve they load them into an improbably roomy sack which Santa carries as he sets out to deliver them to all the good boys and girls of the world. His vehicle is a flying sleigh pulled by eight reindeer named Dasher, Dancer, Prancer, Vixen, Comet, Cupid, Donner and Blitzen (with an option on a ninth, in the form of Rudolph, on nights with poor visibility). You might hear the sound of some Snowy Sleigh Bells as well. He enters each house by the chimney, fills the residents' stockings (left hanging on the mantle for his attention) with the gifts and toys he brought, and then leaves the same way he came in. It is considered polite for the family to set out a treat of milk and cookies, for his snack, and perhaps a tidbit for the reindeer too. It is traditional in certain versions of the legend that Santa can tell when children are sleeping and when they are awake and will only deliver presents to children who go to bed when they're told to on Christmas Eve and won't come if they try to stay awake to see him. This was almost certainly something started by parents in more recent times, as it doesn't seem to appear in earlier versions of the story. It was likely popularized by the line "He sees you when you're sleeping; he knows when you're awake" from the song "Santa Claus is Comin' to Town." (German and Scandinavian traditions use this same idea as Scare 'em Straight Nightmare Fuel for toddlers). Note that this often simply does not apply in fiction and somehow even kids that are shown being told this still somehow end up getting to meet Santa Claus. Officially, Santa delivers presents only to the children who have been good. Naughty children get the Boring, but Practical gift of coal, which they can burn in the furnace for warmth over the winter; not as raw a deal as it might seem to those of us who no longer burn coal ourselvesnote And lives on in the form of still giving kids who don't deserve toys practical items like tube socks. In even older traditions, he carried a bag of switches for whipping the naughty children. In the Netherlands and Belgium, Sinterklaas is famously accompanied in his work by a servant named Zwarte Piet (Black Pete), which tends to cause headaches with foreigners unfamiliar with the tradition and quite aware of the Unfortunate Implications he represents. (Note that in the Dutch tradition, there is no racist connotation whatsoever to dressing up as a jolly blackface servant and threatening to beat people up. Seriously. )note Perhaps not anymore. According to the Associated Press, the 2013 Sinterklass festival in Amsterdam drew protestors saying Black Pete was a blatant racist caricature that should be banned. Zwarte Piet himself is a softening of an even earlier tradition in which Saint Nicholas used the services of an enslaved devil. Austria and southern Germany have The Krampus instead. Many other cultures that still look to Santa Claus as an actual saint still include this devil or imagine Santa Claus as doing battle with the devil on Christmas Eve, leading to even more strange reactions from foreigners who wonder what Satan himself is doing in, say, a children's Christmas film. The traditional explanation for Santa's ability to achieve his annual deliveries is that he is a magical being. In works that think about or play with the implications, this may involve his being The Omniscient: he personally knows where everyone lives, what they want, what they've been doing... However, modern stories dealing with Santa give him access to a combination of magic and supertechnology; some versions even do away with the magic altogether (for example, the Christmas ep of Buzz Lightyear of Star Command has his supertech being used by the villains to commit tons of felonies). In addition, modern depictions of Santa's home have his workshop being a fully mechanized factory run by the elves. A common variation is to have Santa portrayed as not a single magical being, but as a god-like office held by a mortal, such as Ernest Saves Christmas, where Santa is a normal person who spends a large chunk of his (possibly magically lengthened) lifespan as Santa Claus, then passes the title off to someone else. Surprisingly, despite all that focus on Santa's delivery process, the one aspect of the legend that has rarely, if ever, been called into question is how Santa could accomplish such feats and still have huge numbers of people (often a numerical majority, even in fiction) who refuse to believe that he exists. Also, for humorous effect he is often portrayed as a cold-hearted tyrant, running his workshop with an iron fist while the elves are an exploited and resentful workforce. One example of such skewering came at the hands of Futurama, which introduced a futuristic robot-Santa who judged the entire world as naughty (except Zoidberg) and hunted down the worst offenders every Christmas. Running a close second is the revelation by Anya in Buffy the Vampire Slayer that not only did Santa Claus exist, he was in fact a bloodthirsty demon — perhaps inspired by the devil present in older stories of him. Since straight portrayals of Santa Claus in fiction have become classics, and re-aired every year, most recent works involving Santa Claus are parodies, deconstructions, or other twists on the legend. Even in strict children's fare, there is always some kind of wry twist on the material: in The Lion, the Witch, and the Wardrobe, for example, Father Christmas muses that he hasn't been to Narnia for many, many years, and proceeds to hand out lethal weaponry such as bows, arrows, and swords to three of the prepubescent protagonists. A major exception is the film The Polar Express (although, in all fairness, he's portrayed as less jolly than Santa usually is). Since the beginning of the twentieth century, there has also been a small movement to explain how Santa came to be, and continues to be. The most prominent backstory for the modern Santa (meaning, not derived from various folklore), comes from L. Frank Baum's (of The Wonderful Wizard of Oz fame) novel, The Life & Adventures of Santa Claus. This story gives Santa a bit of The Lord of the Rings treatment, as there's plenty of strife and battles between the good fairies that raised Santa, and their enemies, a group of rock-monsters. This story has been made into at least two animated films, and continues to be one of the most popular backstories for Santa over 100 years after its first publication. Speaking of Tolkien, he too made his own spin on Santa Claus in The Father Christmas Letters. The Dresden Files has Harry saying that Santa is a fairy.note Butcher has hinted that he is basically the Fairy King of Winter and a counterpoart of sorts to Mab. One may assume he represents the goodwill and generosity that the harshness of Winter (Mab) brings out in people. Either way, he is a badass, and Harry knows it. Harry's not willing to summon him either. He'll mess with The Fair Folk, but Santa, no way. The name "Santa Claus" comes from a Dutch variation of the name "St. Nicholas", "Sinterklaas". It is not, despite what fundamentalist Moral Guardians like to claim, an anagram of Satan. Well, it is, but that's decidedly unintentional. And his last name is spelled C-L-A-U-S, not C-L-A-U-S-E; the latter is part of a sentence or part of a legal contract. This was the basis for a famous Marx Brothers joke. ("There ain't no sanity clause!") The title of the movie The Santa Clause was an intentional pun on this. An additional note: in the UK and Australia, Santa Claus is often called "Father Christmas" (such as in the C.S. Lewis and J.R.R. Tolkien examples above). Although Santa Claus and Father Christmas have picked up many attributes from each other, and are now basically considered the same person, they were originally distinct characters. Father Christmas was an Anthropomorphic Personification of the Christmas holiday itself (particularly its feasting and drinking aspects), and wore a robe rather than the suit that Santa Claus wears. He was considered to be as old as the first Christmas (unlike St. Nicholas who lived in the fourth century)note As Wiccans will be happy to tell you, he may even be older than that, as the Yule Father, the dating is ambiguous though. Examples of Father Christmas from before his merger with Santa Claus can be found in the Ghost of Christmas Present in A Christmas Carol by Dickens, and in the traditional plays of English Mummers. Santa Claus as a character is widespread even in countries that aren't Christian, like Japan and China. In Japan, he's called not surprisingly "Santa Kurasu" and in China he's called "Old Man of Christmas". If someone needs to be reassured that Santa really does exist, the traditional answer begins "Yes, Virginia"...On the other hand, Santa himself better watch out if he finds himself at a Philadelphia Eagles game, lest he get booed and has to dodge snowballs.note A young man dressed as Santa really did get booed and pelted with snowballs by Eagles fans during the halftime show in a game against the Minnesota Vikings on December 15, 1968, but it was more from frustration by the fanbase at a terrible 2-11 season put forth by the team that year; overall hatred of the team's owner, coach, and quarterback; and the miserable weather (the man himself was a replacement - the original Santa couldn't go due to the weather - and his beard was unconvincing). See also Christmas Elves, Mrs. Claus, Mall Santa, Bad Santa, Badass Santa, Santabomination, Santa Clausmas, Easter Bunny, and The Krampus. Santa's modern-day appearance, at least for those in the U.S., as a plump white-bearded man in a red suit was largely codified by a series of print advertisements for Coca-Cola illustrated by Haddon Sundblom from the 1930s through the '60s. A long-running commercial for Norelco electric shavers featured a Stop Motion-animated Santa riding atop a flying razor head. The ad was updated through the years; the various permutations can be seen here . Since it was first broadcast, an ad for M&M's is now broadcast yearly in which Red and Santa Claus startle each other. Red: AAH! He does exist! In Axis Powers Hetalia, Finland is Santa, following some European Christmas traditions that say that Santa Claus is Finnish. Darkseid tries to stop him from invading Apokolips every year giving him coal. Darkseid always fails. Oh, and Deadpool once choked him out with a string of barbed wire while he (Santa) was driving an eighteen-wheeler. He's made several appearances in Fables, most notably as a "paladin of hope", serving the Anthropomorphic Personification of hope as the representative of the hope for justice, the hope for reward and the hope that everything will turn out all right in the end. He's made a few appearances in some Christmas-related stories, including one where Gargamel drugs him and tries to take his place so he could capture the Smurfs. In the Animated Adaptation, an analog version of Santa named Mr. Nicholas takes on his role. In promotional material, Papa Smurf is shown wearing a Santa Claus suit, and in various forms of media he is often confused with being Santa. Raymond Briggs' graphic novels Father Christmas and its sequel Father Christmas Goes on Holiday depict Father Christmas as an ordinary British working-class man who treats his delivery of presents like a normal job. Jingle Belle, by Paul Dini, tells the story of Santa Claus's rebellious teen-age daughter. Appears once in a while in the Disney Mouse and Duck Comics, his exact role depending on the story. In one memorable occasion, police inspectors Casey and Rock Sassi mistook him for a burglar and arrested him. A MAD Magazine satire of "'Twas The Night Before Christmas" features a Santa that is so fed up with how crappy Christmas has become for him — with no reindeer for his sleigh, no elves to make the toys, no workshop to make the toys due to a lack of insurance and a tax audit, people shooting at him with their guns, irradiation from nuclear plants, among other things — that at the end of the satire he decides that he's going to retire and is seen riding off on his rocket-powered sleigh, kicking the sack of toys off it in disgust. Gets thoroughly discussed one December in Frazz. Frazz even explains how he can afford all the gifts: he licenses his image. In the Empath: The Luckiest Smurf story "Empath And The Red-Nosed Reindeer", the Santa analog Mr. Nicholas gets the idea of wearing a red suit from Papa Smurf's appearance when he first met him years ago as a child. In the Dragon Ball Z Abridged Christmas special, "Christmas Tree of Might", the Turles Crusher Corps are reimagined as a band of Misfit Minions, and Turles himself wants to destroy Christmas because Santa never visited Planet Vegeta (all they ever got was Freeza Day — the day Freeza blew up their planet and brought the Saiyans to near-extinction). Santa himself comes to Goku in a vision during the climax, giving our hero the motivation to win the day, and he then reveals that he did try to visit Planet Vegeta, but the Saiyans always tried to shoot down his sleigh. Vegeta: HA! I did hit him! The polarizing film The Polar Express (based on a book) was all about a boy who traveled on a magical train to the North Pole to meet "the big guy," Santa Claus. It was said that he was at that critical age, where he had pretty much stopped believing in Santa and if something wasn't done, there would be no going back. He went on a journey of discovery where he also met several other characters that were struggling with their own issues, including the lonely boy Billy who had never received gifts on Christmas and the hero girl who would be a leader to others, but needed to have confidence in her own decisions. In the end, the hero boy finally overcame his issues and met Santa, who told him that "Seeing is believing, but sometimes the most real things in the world are the things we can't see." As you might well imagine, Santa Claus is a popular character in Christmas Specials; the most well-known are the stop-motion films by Rankin-Bass. Often times Subbing for Santa is invoked with the main characters of the holiday special. An automobile version of Santa Claus named Santa Car (a vehicle resembling a Dusenburg) actually appears in storybook based on the film Cars called "Mater Saves Christmas." In Caillou's Holiday Movie, the "Where Santa Has a Different Name" song provides details on Christmas traditions around the world, including Denmark, Slovakia and Greece. Lap-sitting is also seen in this special, and in the story "Holiday Magic." In a song available only on the film's soundtrack album, "Riding in Santa's Sleigh," Caillou performs a duet with Santa in which he and Santa sing about Caillou joining him on his sleigh ride to deliver presents. Oh, Santa, can't you take me along? That's all I'm wishing in this Christmas song. Oh, Santa, can't you take me, oh, please? What a wonderful way to spend this Christmas Eve! In the animated special Toot & Puddle: I'll Be Home for Christmas, Toot is rescued by a sleigh-driving man who is strongly implied to be Santa. The Year Without a Santa Claus, title notwithstanding and its sequel film, A Miser Brothers' Christmas, feature Santa Claus as a key character. In the first one, Santa Claus has a cold and plans to skip Christmas, until Mrs. Claus and a couple of his elves go on a journey to help him see that there's still Christmas spirit in the world. In the second film, Santa is injured, so the Miser Brothers are made to take over for him. In My Friends Tigger & Pooh: Pooh's Super Sleuth Christmas Movie, Rabbit's biggest Christmas wish is to meet the big guy, but he figures it's impossible, so he puts on his Christmas list what he feels is a more realistic Christmas wish— a subscription to Rutabaga Monthly, which he reads "for the articles of course." In the end, he gets his real wish when the team travels to the North Pole to return a lost baby reindeer and Santa's sack of toys. Holly Hobbie and Friends: Christmas Wishes includes a subplot in which Holly's brother Robby Hobbie and his friend Kyle Morris try to convince everyone that Robby is Santa Claus when he takes a job as mall Santa. He has trouble getting it to work, due to his small stature and his use of the family pig, Cheddar, as his reindeer, despite his best attempt at a booming "ho ho ho" voice. One girl tells him that he can't be Santa because he's not fat and doesn't have any reindeer, and he tries to convince her that the pig is really is reindeer and that he's skinny because he's gone on a low-carb diet. "Fine! I won't leave you any cookies! I'll eat them all myself!" Despite this, he manages to get the Deegan twins (the sons of the widow in the film) to tell him their true Christmas wish, which, in a twist, isn't something like wanting their father back or seeing their mother happy (though they would like this), but rather to have an earwig farm. Tim Burton's The Nightmare Before Christmas, in which Jack, the leader of Halloweentown, decides to give Santa a vacation by kidnapping him and takes on the job himself. In Rise of the Guardians, Santa Claus is the leader of the title guardians, but is referred as North in the film. In Holly and Hal Moose: Our Uplifting Christmas Adventure, the two title characters spend most of the film at the North Pole and therefore naturally spend a lot of time with both Santa Claus and Mrs. Claus. Arthur Christmas reveals that Santa Claus is a Legacy Character whose position has been passed down from father to son over hundreds of years (naturally, it all started with Saint Nicolas). The current Santa, Malcolm, is getting old and is very out of touch with the new advanced technology that the Christmas Elves use to help him deliver presents on Christmas Eve. His older son Steve, who currently serves as his Mission Control, hopes to succeed him as the next Santa, but his younger son Arthur is the one who really understands the importance of making children happy on Christmas despite being clumsy and terrified of practically everything. Santa Claus Conquers the Martians combines the Santa story with campy no-budget Sci-Fi, and is widely regarded as one of the worst movies ever. In the Mexican film Santa Claus (1959), Santa (and his extraterrestrial army of child laborers) does battle with a demon who is sent by The Devil to persuade the children of earth to do evil.... it Makes Just as Much Sense in Context. Famously riffed by Mystery Science Theater 3000. Killers dressing as Santa Claus is a popular use of Subverted Innocence, as seen in movies like Christmas Evil, To All a Goodnight and Silent Night, Deadly Night. Santa provides the Deus ex Machina in One Magic Christmas — good thing, too, or the events of the film would have been rather appallingly depressing. In The Santa Clause, the protagonist is bewildered to discover himself forced into the job and the appearance of Santa due to a legal technicality. In Miracle on 34th Street, it's a major plot point that grown-ups are skeptical whether "Kris Kringle" may or may not be the real Santa. Elf has Santa needing to be rescued by the main characters at the climax, due to his sleigh failing from lack of holiday spirit in New York. Russian film The Irony of Fate 2 features Grandfather Frost, the Russian equivalent of Santa, who gives presents on New Year's. Kostya borrows a drunken Grandfather Frost's suit to sneak back into Nadya's apartment on New Year's night. Santa and the Ice Cream Bunny has jolly old Saint Nick grounded on a Florida beach. 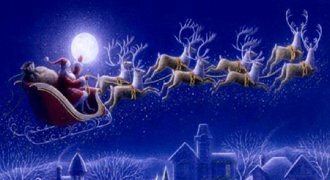 The famous poem "'Twas the Night Before Christmas" (or to give it its proper title, "A Visit From Saint Nicholas") by Clement C. Moore was an important Trope Codifier for Santa, including the names of his reindeer. Another Trope Codifier is The Life & Adventures of Santa Claus by L. Frank Baum, featuring Santa making friends with The Fair Folk and fighting against evil goblins. As mentioned, above, Santa Claus (as Father Christmas) appears in The Lion, the Witch, and the Wardrobe to signal that the White Witch's always-winter-never-christmas power is beginning to fade. Land of Oz: Santa Claus is a friend of Ozma of Oz, and attends her birthday party in The Road to Oz (as a cross-over with L. Frank Baum's book mentioned above). In L. Jagi Lamplighter's Prospero Lost, when Miranda is seeking refuge from demons, she is guided into a mall and finds that the Mall Santa really is Father Christmas. Later, she and Mab visit him to use his pool to look for some children. While there, she takes a gift from an elf — usually a foolish thing, but she knows under his roof, it must be safe. Santa makes an appearance in book Cold Days under the name Kringle. He is one of the strongest members in the court of Mab, the Queen of Winter. He's pretty cool. He is described as bear-like, standing over seven feet tall, with jelly-like belly. He joins The Erl-King to lead The Wild Hunt each Halloween. And is possibly an aspect of Odin. He pops up again in Skin Game. He notes that as he is a vassal of Queen Mab when she asks him to appear for aide, he is obliged to answer. When Harry is hesitant to receive information Santa has about the case Harry is working on as that could put him in a debt to Kringle, Kringle explains Harry can consider it as a belated Christmas gift as Harry's residence the past winter was hard to get to for Santa. In "Christmas Eve" set on the Christmas Eve after the events of the book Peace Talks. He appears to Harry with a gift that brings back memories of Harry's late father and the last Christmas they shared together when Harry was a boy. The Father Christmas Letters were delivered to the children of J. R. R. Tolkien, describing Santa's adventures and misadventures with the elves at the North Pole. Readers of The Lord of the Rings may notice a few Crossover similarities, especially in Santa's elf secretary Ilbereth. Despite her sometimes cynical nature, Junie B. Jones still believes in him and asks him for a Squeez-a-Burp at the end of Jingle Bells, Batman Smells, P.S. : So Does May. "San D'Klass" is mentioned in Artemis Fowl. Apparently a deluded king of the Elves who thought he could assuage the greed of mankind with occasional gifts, he utilized time stop technology to pull it all off in one night and the fact that everyone remains sleeping during a time stop gives Artemis the idea for how to beat it. In The Cat Who Went Into the Closet one of the The Cat Who... Series cat-cozy mysteries by Lilian Jackson Braun, the main human character Qwill agrees to take on the role of town Santa Claus in the Pickaxe Christmas parade. He very nearly bolts when informed only after the parade itself is over that he's expected at the courthouse for lap-sitting, having already endured a bumpy dogsled ride through bitter cold weather, followed by a perilous ladder-climb. Qwill: Lap-sitting? What the devil is that? Wilfred: They built a gingerbread house for you in front of the courthouse, and the kids sit on your lap and have their pictures taken. Qwill: Oh, no, they don't! I refuse flatly! Enough is enough! Wilfred: Mr. Qwilleran, sir, you gotta! The Ninth Doctor claims to be Santa in one episode. Rose: Look at you, beaming away like you're Father Christmas! Doctor: Who says I'm not, red-bicycle-when-you-were-twelve? In the 2010 Christmas Special, the Doctor says he is a friend of Santa's, providing a photo of him and Santa at Frank Sinatra's hunting lodge in 1952. It is revealed that there are thousands of Santas in Round the Twist. As Santa #115,302 notes, "It'd take more than one Santa to get down all those chimneys in one night, get real!" Also, Santas have handily evolved claws after hundreds of years of scrambling up chimneys. In the sketch show Man Stroke Woman Santa apparently lives like a completely normal person with a girlfriend who is completely unaware. That is until she finds all the children's letters when they are packing for a move. He is adamant he is not, though he doesn't hide it very well. On LazyTown, one of the resident Dastardly Whiplash Robbie Rotten's schemes involved dressing up as Santa. I'm so glad that I'm so tricky, even so Saint Nicky. In "A Very Spritely Holiday" on Johnny and the Sprites, Gwen tells Johnny that she's (currently) one of Santa's helpers. Barney & Friends features Santa in many of the series' Christmas specials. Notably in Barney's Night Before Christmas, where Barney and his friends visit Santa's workshop and meet the jolly old man himself and Mrs. Claus. In his various appearances in the Christmas specials, it's noted he and Barney are old friends, both being magical beings who help children in need. In Waiting for Santa, while Santa himself doesn't show up until the end, Barney and the Backyard Gang still visit the Workshop and visit Mrs. Claus in a quest to give them Derek's new address. Santa is one of the main characters in the Norwegian series Vazelina Hjulkalender, starring Vazelina Bilophoggers. In this series, he accidentally crash-lands in the wrecking yard in the beginning of December, and the band have to help him get his sled fixed in time for Christmas. This series depicts Santa as skinny and unable to grow a proper beard, with his famour look being a disguise he adopts so he'll better fit the public image of him. Santa appears in season 4 of The Magicians. He began as a human magician who learned forbidden magic that allowed him to become Santa, complete with sleigh and Chimney Entry. The Library eventually caught and imprisoned him, because he had to steal from their forbidden archives to gain that knowledge. In the song "The Wonderful Kingdom of Claus" by Bob Rivers and Twisted Radio on their album "I Am Santa Claus," Dorothy and Toto visit the mall to meet Santa Claus, only to be at first turned away by his elves. Dorothy says that she has a gold card and the elf comments "That's a card of a different color!" and lets her in. She and Toto are met by a booming voice declaring himself to be Santa Claus, but it is eventually revealed to be a skinny guy. He explains that Mrs. Claus put him on the SlimFast diet. "I used to have a belly that shakes like a bowl-ful of jelly. Now I just have shakes. One for breakfast, one for lunch, and a sensible skim milk and cookie for dinner. I can't stand it." He reveals that he and the elves no longer make toys at his workshop at the North Pole because they got undercut by the malls, and so he's just a middle-man who delivers toys now. He and his elves then launch into a parody of "If I only had a brain." "We thought we made it all, from Barbie dolls to rubber balls / But Betsy-Wetsy took a fall. / They marked her down! / She's at the mall!" After the song ends, Dorothy laments his fate, but just then a savior shows up, hooking Santa up with a fax machine and pager (yeah, it's pretty dated, though the package does also include a cellular phone with voice messaging) Santa and his operation are saved, and Dorothy and Toto are left to lament how now he'll easily be able to check up on who's naughty and who's nice. The headline song from the same album as the above song, "I Am Santa Claus," is a parody of Black Sabbath's "Iron Man." Of course, Santa figures prominently in many popular Christmas Songs, including such fare as "Santa Claus is Coming To Town," "Here Comes Santa Claus," "Jolly Old Saint Nicholas," "Must Be Santa," "Rudolph The Red-Nosed Reindeer," and "I Saw Mommy Kissing Santa Claus." Darkly spoofed by "Weird Al" Yankovic in "The Night Santa Went Crazy," which features Santa having a psychotic break and going on a killing spree. Santa gets a Jewish treatment in the Klezmonaut's song "Santa Gey Gesunderheit ." The singer praises Santa's work ethic and wonders how he manages to put up with it all without complaining. In Bells Are Ringing, Santa Claus is one of the voices that Ella does over the phone. She uses it to tell a little boy named Jimmy Mallett to eat his spinach. Yes Virginia: The Musical has not only Scraggly Santa, a homeless man playing the part, but has eight versions of Santa Claus from around the world appear for "Santa by the Book", a song about how Santa is real, and exists in different forms around the world, and the Jolly Gentleman is implied to be Santa Claus in disguise. In Secret of Mana, when the children of the world stop believing in him, Santa tries to use the Mana Seed of Fire to grow a wonderous Christmas Tree that will make them believe, and help him to spread the true meaning of Christmas across the world. This... doesn't quite work. The seed's power warps him into the hateful Frost Gigas, and the heroes have to fight him to break the curse. Yes, you read that paragraph right. That all happens. The model for the infamous old man on the lying cover of Phalanx had just come from a Santa shoot. There is a downloadable skit for Tales of Graces in which Sophie mentions that she recently learned all about Christmas from Malik, and then proceeds to tell that gang about Santa Claus... who she has been led to believe is a man who carries an axe and wanders through the night on Christmas Eve, chopping down the chimney's of houses. Cue a cut-in of Malik dressed as Santa, beard, sack, and all, holding an axe and having the expression of some sadistic murderer. Note that Malik regularly tells outlandish tales to the naive Sophie and this seems like his regular behavior, so the skit is made even funnier when Malik claims that he heard the story from Richard. Santa appears in Kingdom Hearts II as part of the Halloween Town / Christmas Town section from The Nightmare Before Christmas. Maleficent schemes to turn him into "Santa Heartless." James Pond 2: RoboCod is set in Santa's main toy factory at the North Pole, which has been taken over by Dr. Maybe. The ending has Santa fly by in his sleigh and drop a bag of swag on Dr. Maybe's head. In Star Ocean: The Last Hope, Santa is a wandering merchant who sells stuff at insanely high prices in the Wandering Dungeon and can be encountered randomly. When the main protagonist, Edge, first sees him, he suggests that he might be some cosplayer, but he is actually Santa. Despite the high prices, a lot of his stuff is really good, or at the very least unique. That doesn't stop Edge, once you exit the shop menu, from complaining that he'd have to take out a mortgage to afford the stuff. Special Delivery for Atari 8-Bit Computers has you play as a Santa who has overslept on Christmas Eve and hence has only five hours to make his rounds. His helpers drop presents from clouds, but he still has to descend chimneys to deliver them himself. In the webcomic Holiday Wars, the Easter Bunny kills Santa Claus and declares war on all the other holidays. In Sinfest, he has a Santa signal . And gives Slick socks. In Bob and George, the origin story has Protoman thinking that Dr. Light is Santa Claus (though he may have been intended to resemble Edison) . In Urban Underbrush, when Caius was dying in the snow , he saves him. Or so Caius remembers. In Sluggy Freelance he first gets infected by alien DNA and later eliminated by Bun-Bun. Luckily, Bun-Bun later is forced to hit the Reset Button. Whomp! reveals that he is the Disappeared Dad of Ronnie that has only recently tried to reconnect with him. Ronnie is also noted to have inherited some of Santa's magical abilities. Only in Sleepless Domain can Santa be re-imagined as a Magical Girl: in their world presents are delivered by Holly Jolly, an immortal magical girl that uses her powers of passing through barriers, slowing down time, and carrying infinite presents in her Bag of Holding to deliver presents to children at Crimmus. Someone left Anemone a present under her Crimmus bush, greatly hinting Holly Jolly is Real After All. Rocket Santa , a silly Web Game where Santa wants to give presents to Space Marines on the moon, so he straps on a Jet Pack and climbs into a circus cannon. Santa appears in the opening of the Van Beuren Studios Cubby Bear cartoon "Opening Night" and also appears in the Little King short "Pals / Christmas Night". Jackie Chan Adventures: Daolong Wong once tried to steal Santa's chi. Dora the Explorer has Dora's Christmas Carol Adventure in which, after one too many times of swiping on Christmas, Santa Claus puts Swiper (Swiper, No Swiping!) on the Naughty List. He and Dora have to travel forward and backward in time through three time periods to help Swiper reform. In a Bad Future, they discover that after being put on the Naughty List, Swiper became a mean old curmudgeon who swipes no matter what ("Swiper, no swiping!" no longer worked) and who lived in a castle and always littered. Prior to this transformation, Swiper was a somewhat sympathetic character with a fondness for puppies and who had a conscience that could be appealed to. So, nice job breaking it, Santa. Thankfully, Dora was able to guide the way and get Swiper off the naughty list, preventing the Bad Future. On Pucca, since Santa only does his his actual job one day a year, he spends the remainder of his time living in the hometown of the other characters on the show and does a variety of odd jobs. In one episode of Mike the Knight, Mike tries to deliver the presents for Santa to get off the naughty list, not realizing he was never on the naughty list, it's just that his present was very big and so hadn't been delivered yet. A followup episode had Mike as Santa's good friend and trying to help him out when one of his reindeer got sick. In the Phineas and Ferb Christmas special, Santa is revealed as The Chessmaster behind the misadventures in the episode, which he arranged so that everyone could get what they really wanted for Christmas, including giving Phineas a chance to take on the role of Santa, his hero. The boys build him an awesome winter clubhouse as a gift that he takes back to the North Pole. Santa has once shared a chimney-vator with Perry the Platypus, who couldn't help but beam in his presence. He later shows up, doing a summer run, his sleigh providing aid at a crucial moment for Perry, who starts beaming again. Strawberry Shortcake and Honey Pie Pony meet him and talk with him up at the North Pole in Strawberry Shortcake: Berry, Merry Christmas. In Arthur's Perfect Christmas, Arthur's little sister D.W. is still a firm believer in Santa Claus. When she finds out that she might not be getting the gift she wanted, Tina the Talking Tabby, she concludes that Arthur wrote her letter "all wrong" and decides that if she wants something done right, she has to do it herself. When the Tibble Twins see her mailing the letter, they tease her, but she tells them that it's to the President of the United States, leading one of them to conclude "Oh, so he's the one who delivers all the presents." In the Doc McStuffins Christmas Episode "A Very McStuffins Christmas," the elf spends most of the episode avoiding Santa because he's worried about what he'll think of him. Santa, however, likes his work and gives him a promotion. He also reveals that he's been following Doc McStuffins' career with considerable interest and offers her a job, but she declines. In "The Ice Moose" You Mean "Xmas" episode on PB&J Otter, the Ice Moose, Old Tim, is this and delivers presents. In "Peppa's Christmas" on Peppa Pig, both Peppa and her little brother George get to meet Santa. The episode seems to imply that the only reason Santa goes up and down the chimney is because he never thought of simply using the door. The vocal credits for the episode list "Father Christmas as himself." Santa: [pulling Max's Santa hat over his eyes] Don't look, Max. Santa: Nobody is supposed to see me. In "The Living Holiday Lights", from Special Agent Oso, when Whirlybird appears to ferry Oso across the sea to the United States, he asks if Oso was expecting Santa Claus. Eddie books an appearance for him on Class of 3000 in an attempt to impress Tamika. He's portrayed as a black man, but is otherwise pretty standard Santa. Oh, and Sunny holds a deep grudge against him (Santa misinterpreted Sunny's Christmas list when he was a child, leading to him getting injured and losing his prized part in a school play). On Atomic Betty, Santa is a Humanoid Alien with Pointy Ears. A version of Santa Claus routinely showed up in the various examples of Christmas Episode and Christmas Special produced by Hanna-Barbera. Comes to help Scooby and Shaggy in Scooby-Doo! Haunted Holidays. Potsworth & Company: The episode "Santanapped" is Exactly What It Says on the Tin. Also several christmas especial of The Smurfs, in one of them he is turn evil by Chlorydris. Santa Claus exists in the Men in Black animated universe and is not an alien, but everything around him is explain with sci-fi elements and not magical. For example; his Elves are actually aliens, his flying reindeers are robots made by the Arquillians, the North Pole is a facade (he lives in New York) and in case he can't fulfill his work the higher ranking MIB should cover for him (Zed) which imply that the title of "Santa Claus" is given to a particular human and not a magical being. Albeit Santa does shows some unexplained abilities like helping Jay finding a suitable present for Kay. In The Real Ghostbusters Christmas episode "X-Mas Marks the Spot" the eponymous ghostbuster overhear Santa and his reindeer traveling in the sky. Santa is implied to be not human but a spirit like the Spirits of Christmas Past, Present and Future shown to be authentic in that episode. Santa appears in a typical Tex Avery gag in the M-G-M cartoon "Who Killed Who?" The detective approaches a door that has a sign reading "Do not open till Xmas," and he frantically tries to get the door open. When he does, Santa is on the other side and says "Listen, doc. Can't ya read?!" and bops the detective on the head. He appears at the end of the animated If You Give a Mouse a Christmas Cookie, just after Mouse sneaks a bite of the cookie left out for him. He leaves Mouse and Oliver's presents, and then Mouse hands him the cookie. Oliver: He's going to want a glass of milk to go with. In a Loose Canon Avengers, Assemble! Christmas special, Santa is a legendary figure across all nine realms. His mixed heritage of Frost Giant and Light Elf grants him Reality Warper magic powers to bend spacetime and deliver his presents to every good child across all realms. While Santa has yet to appear in Ducktales 2017, based on an animatronic Louie put up, he's a polar bear. He also did something that made Scrooge have beef with him. "That man is not allowed in my home! He knows what he did." "That churlish chimney-chaser is not to be trusted!" The time he executed the Coca-Cola board of directors for illegally using his image. The time he had an existential crisis over discovering the world runs on Grey and Grey Morality. Both the times he had a rivalry with Superman. One time ended with him stranded on the moon while Superman seduced Mrs. Claus, the other time ended with them making up and kidnapping Lex Luthor. There's also Composite Santa Claus, who's half Santa, half snowman. (And by half it's literally down the middle.) He's usually felled by 'his only weakness' (which changes each sketch). The mythology of Santa Claus originated from the very real Saint Nicholas, a Byzantine Bishop from the fourth century that performed miracles and gave gifts in secret (most accounts of his life agree that he was the only child of a wealthy family, and when his parents died he used his new wealth to finance his clandestine generosity). After centuries of his legacy being mythologized, the modern day Santa is so far removed from Saint Nicholas that the two are treated as separate icons.